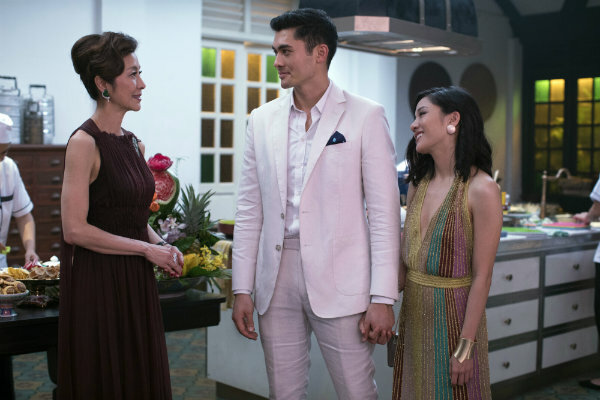 The opening weekend for "Crazy Rich Asians" was historic. Its second weekend was even more impressive. The romantic comedy sensation slid just 6 percent from its chart-topping debut to again lead the box office with $25 million in ticket sales, according to studio estimates Sunday. Almost as many people turned out over the weekend for "Crazy Rich Asians" as they did for its opening Friday-to-Sunday bow — an unheard of hold for a non-holiday release. Drops of close to 50 percent are common for wide releases. But propelled by enthusiastic reviews and an eagerness for a major Hollywood film led by Asian stars, "Crazy Rich Asians" is showing almost unprecedented legs. After opening last weekend with $35.3 million from Wednesday to Sunday and $26.5 million over the weekend, the Warner Bros. release — the first Hollywood studio movie in 25 years with an all-Asian cast — has already grossed $76.8 million. There are a few other stray examples of movies that held so well without adding substantially more theaters like "Brother Bear," ''Puss in Boots" and "Mother's Day," but that's about it. Even "The Help," which also opened mid-August, slid 23.1 percent in 2011 on its way to $169.7 million domestically and four Oscar nominations including best picture — a path that's not out of the question for "Crazy Rich Asians." 4. "Mission: Impossible — Fallout," $8 million ($13 million international). 5. "Mission: Impossible — Fallout," $13 million.